In a large enough bowl add the flour and salt and mix to combine. Add the water and knead into a stiff dough. Taking a piece of dough at a time, form ropes about 16 cm long and about 6 cm in diameter. With these ropes, form two circles, place them one inside the other and press the ends in order so they stick together to prevent them from opening during cooking. Another way of doing it is to form a snail of two circles. Place your finished cookies on a parchment paper until all the dough is used. 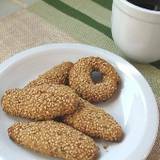 Heat up some water in a sauce pan and boil the cookies on low het until they are cooked. Once they are cooked, remove from the boiling water and place them into another clean sauce pan, keeping the boiling water. Pour the carob syrup into the sauce pan with the cookies and 1/2 a cup of the water you used to boil them in. Place the sauce pan over heat for a few minutes stirring constantly to mix the carob syrup with the water and thin it out. Place in a deep dish and serve hot in their liquid. 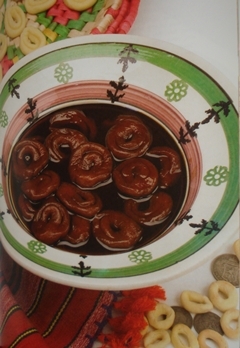 Carob syrup can be substituted with grape juice syrup called “Epsima”. 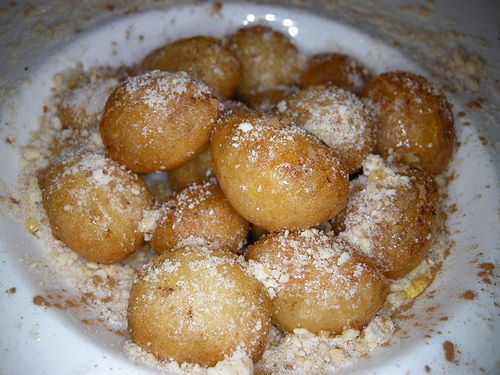 Koulouria me Teratsomelo (Xaroupomelo) (Cookies in Carob Syrup) is a Cypriot dessert that in the old days they were made out of one circle, they were baked in the oven without syrup and they were thrown to the newly-weds during their wedding ceremony “Isaia Xoreve” in church. 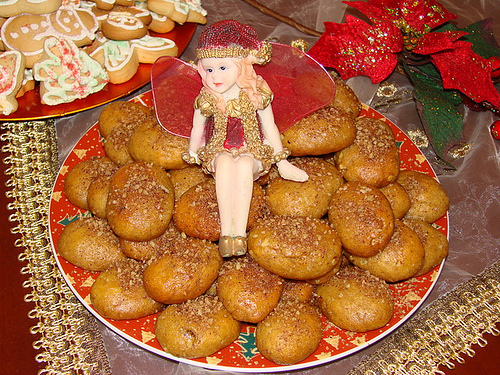 This tradition is not done any more in Cyprus except maybe from some villages where they are strict on Cyprus traditions.